PC Case Fans are one of the most important computer components and they are primarily responsible for ensuring proper airflow in your computer. Without them the temperature inside your case can get high which can then increase the temperature of your major components i.e. CPU, graphics card, hard drive, memory, motherboard etc. This may lead to damage and thermal throttling of the components, thereby reducing their performance and lifespan. PC case fans comes in various sizes, models, speeds and varieties from different brands and manufactures. Some of them are higher in quality, performance and have longer lifespan. Also, some of the computer fans can be very noisy and some of them are silent in operation. Generally fans with higher RPM, low quality bearing and un-optimized design tends to be on the noisier side. Noisy fans can be a very annoying as they make whining or grinding noise which is intolerable and frustrating to cope with. It also possesses hindrance to your work. So, it is always better to use good quality silent PC fans in your case that can provide a great balance between performance and quieter operation. Yes, they may have a bit lower fan speed or RPM but still they are very much effective in keeping your PC case cool because of their optimized design. Also, if you want to install more fans in your PC case then it is better to use quiet fans as their collective noise level will not add up to the point where they can drive you crazy. The noise level of computer fans is measured in unit called decibels, denoted by dBA. Below you can see the noise levels of different noise sources. You can clearly see that any noise level between 10 dBA to 25 dBA is pretty quiet and can be easily tolerated by us without causing any disturbance in work. So, here in this post I am going to list down the best quiet PC fans with noise level rating below 25 dBA. These silent PC fans can be used as both exhaust and intake fans in computer cases. Also, some of these quiet fans have higher static pressure too and can be used on heatsinks, radiators and in restricted spaces. 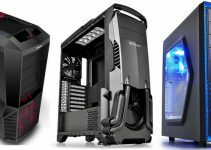 You can use these quiet case fans in Gaming PC, HTPC, Video Editing PC, Workstation PC, Servers or in Silent PC Cases for building a super quiet PC. Note: The unit that is used to measure fan airflow is CFM, which stands for cubic feet per minute and is the volume of the air (in cubic feet) moved by the fan in one minute. Higher the CFM value of the fan, the more air it will move in an open surrounding with no obstructions. On the other hand static pressure of a computer fan is measured in mmH2O, which is defined as the pressure exerted at the base of a column of water exactly 1 millimeter (mm) high. Higher the mmH2O rating of a fan, the higher is its static pressure. Here are the best quiet 120mm fans for use in PC cases as an exhaust or intake fan and for use on heatsinks and radiators. Noctua makes one of the best PC fans in the business. Their fans offer great performance and they are also much quieter than the fans from other brands in the same league or competition. Here we have Noctua NF-S12A PWM Fan which is a Silent Series fan from Noctua having 120mm form factor. The fan comes with Noctua’s proprietary SSO2 bearing which is known for its long lasting life and quiet performance. This is a PWM fan and has speed in range of 300 to 1200 RPM. There are six fan blades with greater gaps in between them for achieving higher airflow and quieter performance. The fan generates airflow of 63.27 CFM and static pressure of 1.19 mmH2O. It is almost super silent in operation with maximum noise level rating of 17.8 dBA only. The fan also comes with anti-vibration rubber pads on all the corners to reduce vibrations and the noise generated by it. Due to its decent amount of static pressure and Anti-Stall Knobs, it can also be used on heatsinks and radiators. Other major features of this silent fan include Anti-Stall Knobs, AAO (Advanced Acoustic Optimisation), Inner Surface Microstructures, Metal Bearing Shell and NE-FD1 PWM IC. The fan comes bundled with Low Noise Adapter (L.N.A. ), which you can use if you want it to be extra silent at the expense of rotational speed and performance. In my opinion this is one the best high-quality quiet fan that you can get. Highly Recommended by me. P.S. – If you want a cheaper alternative then you can opt for Noctua NF-S12B redux-1200 PWM which is also a very good silent fan and has 18.1 dBA noise level rating. If you are looking for a high performance silent fan then Noctua NF-A12x25 PWM is the perfect choice. 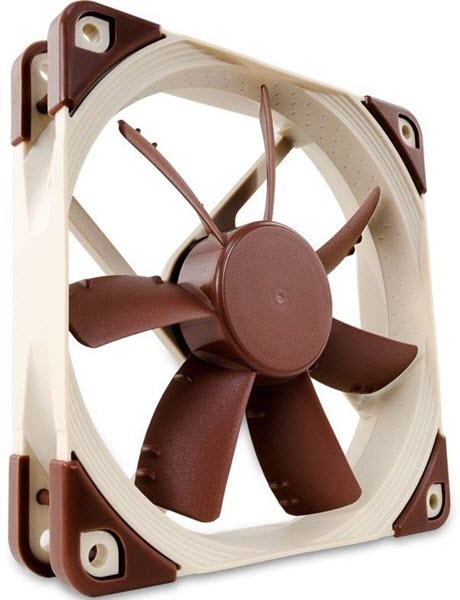 This is a next generation hybrid fan from Noctua that offers good airflow along with high static pressure, and can be use in computer cases as well on watercooling heatsinks and radiators. The blades of this fan are specially designed and are more curved and closer to each other which makes it to achieve this dual functionality. It is a PWM fan with SSO2 bearing and has speed in range of 450 to 2000 RPM. The fan generates airflow of 60 CFM and static pressure of 2.34 mmH2O which is remarkably good for a quiet fan. It has maximum noise rating of 22.6 dBA which is excellent for such a high RPM fan, and even when it runs at maximum speed the fan is pretty quiet. There are anti-vibration rubber pads present on all the four corners to keep noise level to minimum as possible. Also, this fan is even better than the popular Noctua NF-F12 PWM Fan, both in terms of performance and quietness. The fan comes bundled with Low noise adapter, Anti-vibration gasket for water cooling radiators and an optional 140mm adapter to fit in radiators with 140mm fan mount points. The fan is on the expensive side but if you want a high-quality quiet fan with good airflow & static pressure performance then it is worth every penny. Highly Recommended by me for performance & enthusiasts. If there is any fan that can compete with Noctua’s fans in terms of performance and silent operation then it is this be quiet! SILENT WINGS 3 120mm PWM Fan. The fan contains seven blades that are optimized for both airflow and static pressure. This makes it a multipurpose or hybrid fan and it can be used with heat sinks, PC cases and radiators. It generates airflow of 50.5 CFM and static pressure of 1.79 mmH2O which are very good figures for a silent PC fan. This a PWM controlled fan and comes with fluid dynamic bearing for longer lifespan and quieter operation. Also, the 6-pole motor on this fan contributes to lesser power consumption and vibration. The maximum speed of this fan is 1450 RPM and it has noise level rating of 16.4 dBA only. The corners of this fan are fitted with rubber padding mounts for reducing noise and vibrations. The build quality of this fan is pretty great too. The fan comes in all black color and is a bit on the expensive side. But if you are an enthusiast or a user who does not want to compromise on performance and quality then this fan is for you. 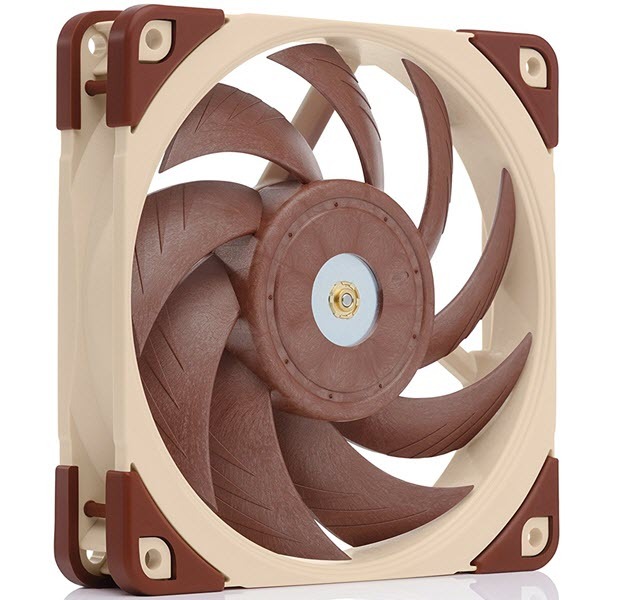 Here we have one of the most silent 120mm case fans, which is the 800RPM version of Scythe Kaze Flex 120 Case Fan. 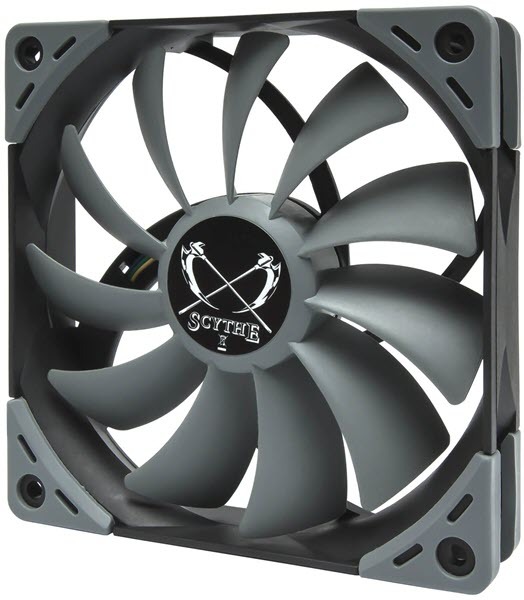 This is a superb quality 120mm fan from Scythe, that comes with Fluid Dynamic Bearing and a 3-pin connector for connectivity. The fan generates good amount of airflow of 43CFM at maximum speed of 800RPM. It is super silent in operation with maximum noise level rating of 14.5 dBA only. The fan also comes with Anti-Vibration padding on all the four corners to absorb shocks for quieter and stable operation. This fan is also available in 1200 RPM and 2000 RPM versions that offers greater performance, but they do generate more noise too. Also, a PWM variant is available too that has speed in range of 300 – 1200 RPM, and can be used in CPU Coolers. This Scythe Kaze Flex 800 RPM case fan is best suited as an exhaust case fan and should be avoided at front because of its low static pressure. It can be used in HTPC, Media PCs, or in Workstation PCs where you want to keep the noise to minimum level. You can check out all other variants too from the links given below. 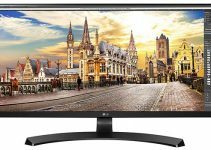 Cougar is a company that mainly focuses on fancy gaming computer products that include mice, keyboards, headsets, power supplies, gaming chairs, cooling fans and accessories. 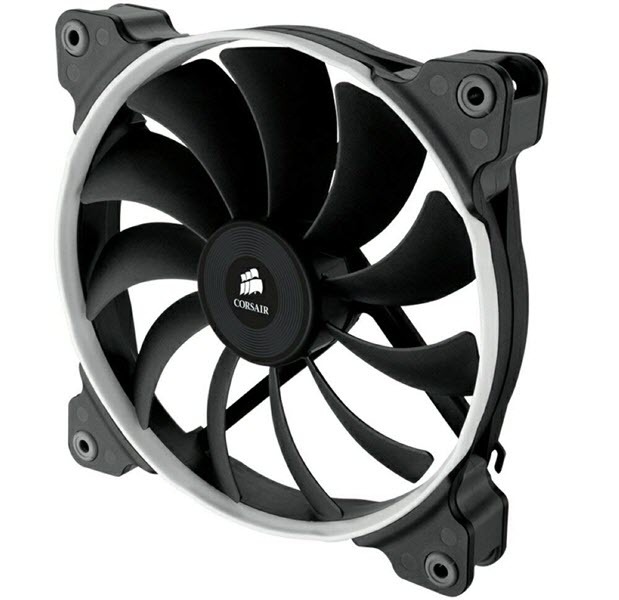 Here we have a silent and high performance 120mm fan from it which is Cougar Vortex PWM Fan. The fan uses Hydro-Dynamic-Bearing for reliability, longevity and smooth & silent performance. The Diversion Groove Blade Design of the Fan helps in focused airflow to increasing the cooling performance. This a 4-pin PWM fan and it rotates at speed of 800 to 1500 RPM and generates airflow of 70.5 CFM at 17.0 dBA noise level, which are commendable figures for a silent fan. The fan is fitted with anti-vibration pads at all the four corners to absorb vibration for minimizing noise. The build quality of the fan also deserves a praise. The fan is available in orange and black colors and you can check both of them out from the link given below. Corsair Air Series AF120 Quiet is a stylish and beautiful looking quiet 120mm fan from Corsair. This Air Series AF case fan is an airflow fan and is meant to be used in unrestricted spaces in your PC case at the rear or on the top as an exhaust fan. The fan is very quiet and its noise rating stands at 21 dBA at full speed. This quiet airflow fan comes with 3-pin connector, hydraulic bearing and spins at a constant speed of 1100 RPM. It generates airflow of 39.88 CFM and static pressure of 0.5 mmH2O. The fan may not be able to compete with the above mentioned Noctua fans in performance but it has good build quality and is cheaper too. However, it does move only decent amount of air and is best suited as an exhaust fan. You may also use it as an intake fan at front, bottom or side panel only in unrestricted environment but if you have restricted space like HDD cages, drive bays etc. just in front then I would suggest you to go for the Corsair Air Series SP120 Quiet Edition High Static Pressure 120mm Fan. This Corsair Air Series AF120 Quiet fan is equipped with rubber pads on the corners for reducing noise and vibrations. Also, to match your system color profile the fan comes with interchangeable colored rings in red, blue and white. So, if you are looking for quiet exhaust fans for your computer case then you may want to have a look at it. 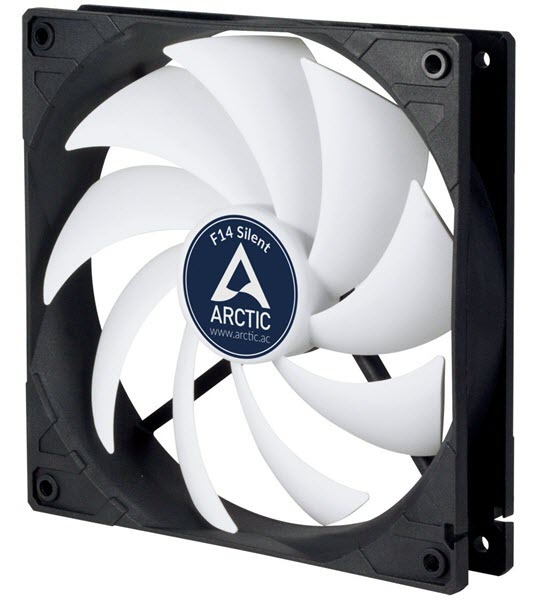 Arctic F12 PWM is one of the cheapest quiet computer fans that you can get for your PC case cooling. The fan has black frame with 9 white fan blades that are curvy and are designed for airflow use only. It comes with fluid dynamic bearing for longevity and for smooth and silent operation. 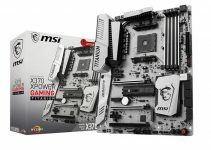 The fan requires 4-pin PWM connector to operate and has maximum speed of 1350 RPM. The airflow generated by this fan is 53 CFM but strangely there is no information about the static pressure, even on its official site. This fan is best suited as an exhaust fan but you can also use it as intake fan too for your computer case. The noise generated by this fan at full speed is 22.5 dBA which falls in the silent category. The fan does lack anti-vibration rubber paddings at corners but still the fan remains very quiet even at maximum RPM. 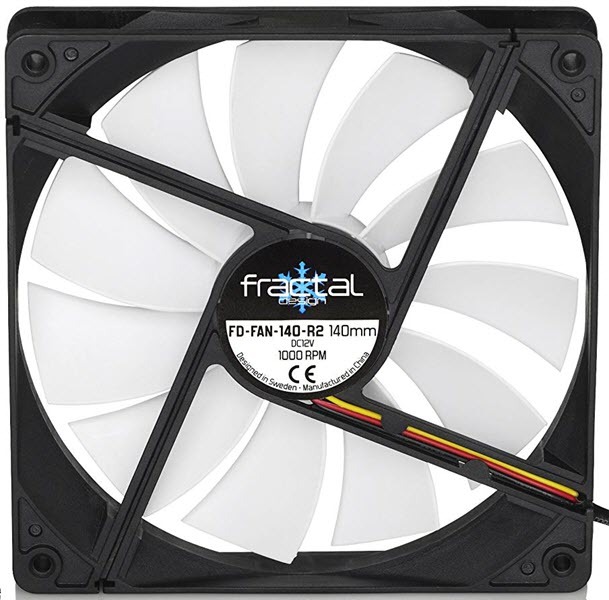 So, if you are on tight budget and looking for some cheap and quiet 120mm fans for your PC case then look no further. Highly Recommended for users on budget. P.S. 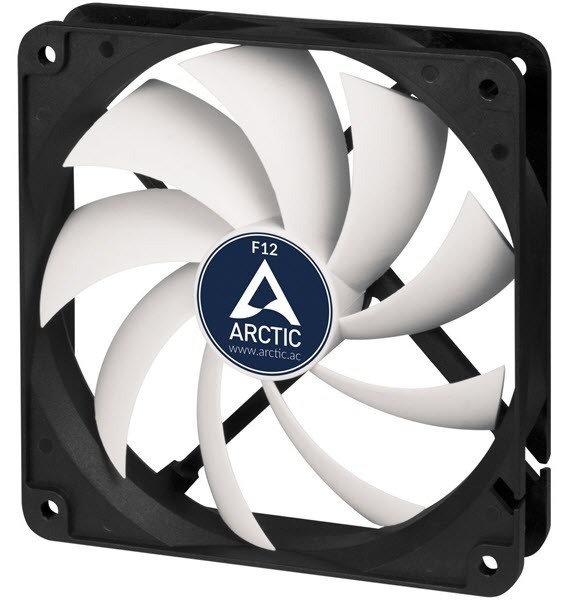 – There is also a silent version of this fan which is Arctic F12 Silent. It is a 3-pin fan with speed of 800 RPM, airflow of 37 CFM and reduced noise rating of 20.5 dBA. You can also check out this fan from the link given below. Another budget 120mm quiet fan but this one is trendy looking and comes with some extra nifty features. 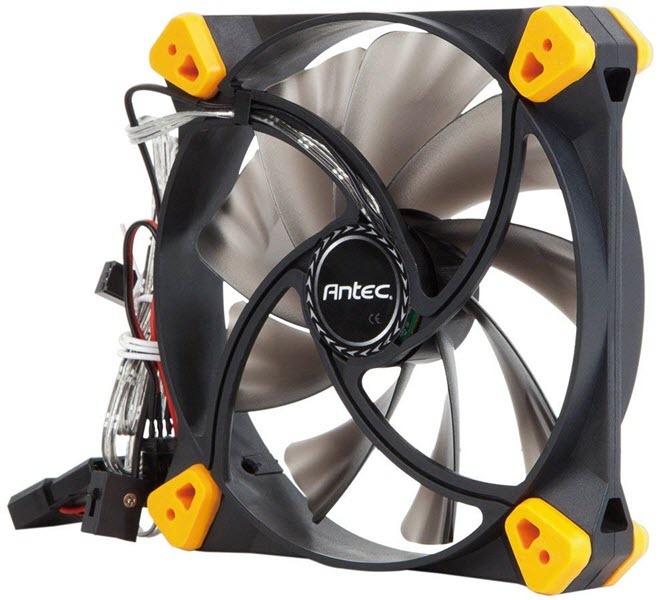 The fan here we have is Antec TrueQuiet 120 which is a silent case fan from Antec. The fan comes with sleeve bearing and is equipped with silicone grommets and possesses a uniquely-designed fan blade to reduce turbulence, vibration and noise for overall quieter operation. It uses 3-pin connector and a 2-way switch which is used to control or switch the speed of fan to 600 RPM or 1000 RPM. The fan generates airflow of 35.8 CFM which is a bit on the lower side, and has noise rating of 19.9 dBA at full speed. A 3-pin to 4-pin molex connector is also included with this fan. 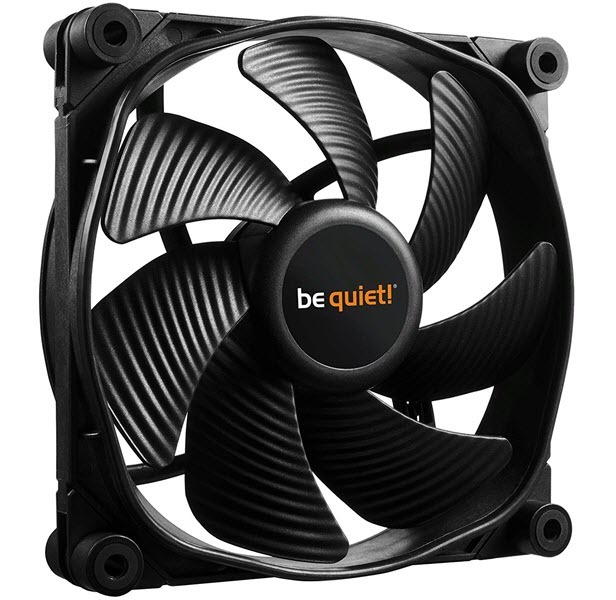 Overall, a decent cheap quiet fan that can be used as an exhaust fan for your PC case. 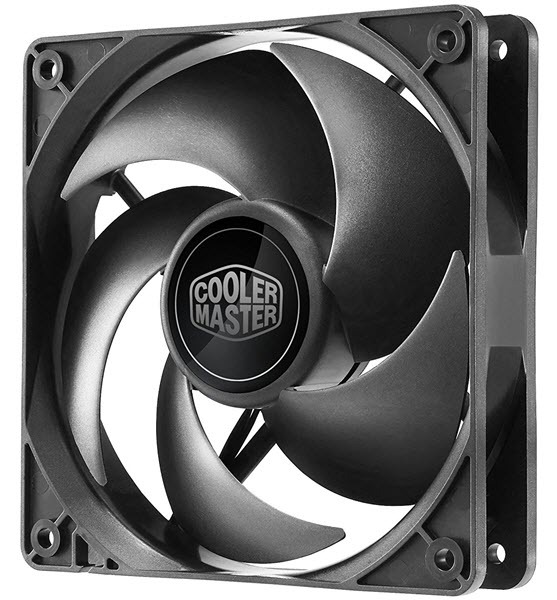 Here we have a super silent fan from Cooler Master which is Cooler Master Silencio FP 120 PWM. This is a multipurpose hybrid fan because it generates decent amount of static pressure in conjunction with good airflow. The fan churns out airflow of 44 CFM and static pressure of 1.69 mm H2O. It can be used on heatsinks, radiators and in computer cases as exhaust and intake fan. 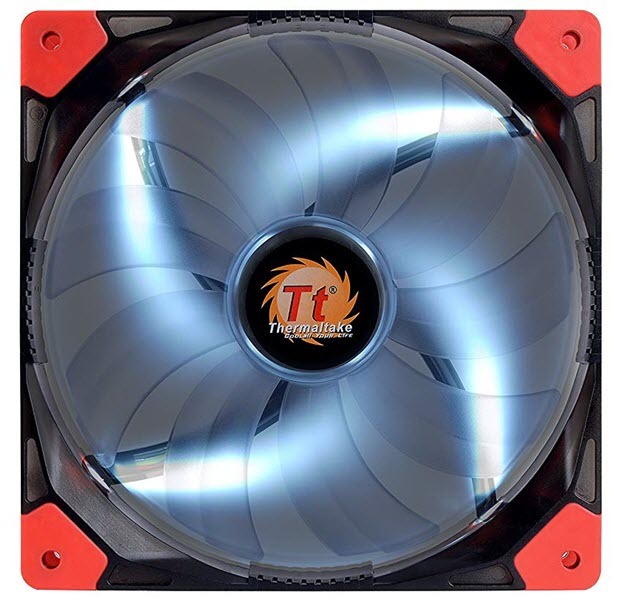 This 120mm silent fan comes with Cooler Master’s Loop Dynamic Bearing (LDB) which has self-lubricating and IP6X dust-proofing design for smoother operation and longer lifespan. It uses 4-pin PWM connector and has spins at speed in range of 800 to 1400 RPM. The blades of this fan are very curved and they are pretty different in design from other silent category airflow fans. The fan does lack rubber pads on corners but it still manages to stay very quiet even at full speed because of its Silent Driver IC. Overall, a good silent fan that is worth checking out. Here are the best silent 140mm fans for use in PC cases as an exhaust or intake fan. Some of them can also be used on radiators and heatsinks because of their higher static pressure. It must be noted that 140mms fan are generally quieter than the 120mm ones and generates higher airflow at lower fan speeds. Some of these below mentioned silent computer fans are the 140mm variants of the above mentioned 120mm fans. 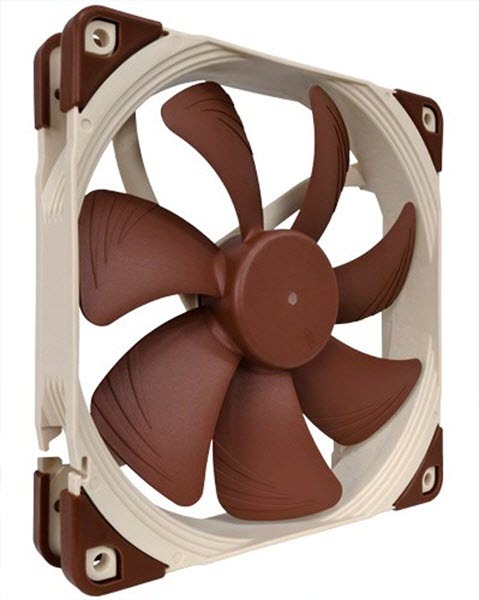 Noctua NF-A14 FLX is a high quality 140mm fan that offers a great balance between performance and silent operation. The fan comes with SSO2 bearing and uses a 3-pin connector for power. It spins at constant speed of 1200 RPM but using the bundled Low-Noise Adaptor (L.N.A.) and Ultra-Low-Noise Adaptor (U.L.N.A. ), the speed can be reduced to 1050 RPM and 900 RPM respectively for super silent operation. At maximum speed, the fan generates noise of 19.2 dBA which is considered to be in a very quiet range. The fan offers good amount of airflow and static pressure at 68 CFM and 1.51 mm H2O respectively. This makes it a good option to use as a case fan and fan for heatsinks and radiators. The fan comes with integrated anti vibration pads to minimize vibrations and noise. Other features include Flow Acceleration Channels, AAO frame, Stepped Inlet Design, Inner Surface Microstructures, Metal bearing shell. The fan has square frame with 140mm mount holes for use in 140mm radiators and case mount points. Note: This fan is also available in PWM and ULN (Ultra Low Noise) variant. The PWM variant (Noctua NF-A14 PWM) has higher 1500 RPM and noise rating of 24.6 dBA, while the ULN variant which is Noctua NF-A14 ULM has maximum fan speed of 800 RPM only and noise rating of 11.9 dBA at max. You can check out all these three variants from the links given below. 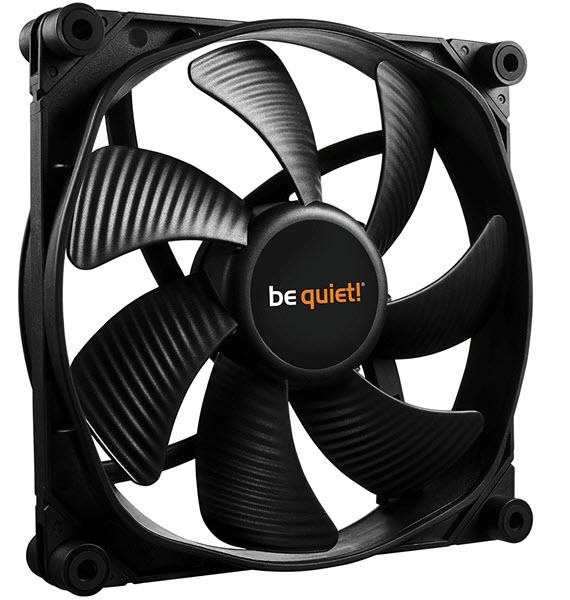 This is a quiet 140mm fan in the be quiet! SILENT WINGS 3 fan series. I have already covered the 120mm variant above in this post. The 140mm variant offers higher airflow, lower noise but generates a bit less static pressure. It retains all the qualities and features found in the 120mm fan that includes 6-pole fan motor, Fluid-dynamic bearing and rubberized mount holes. The fan has lower speed of 1000 RPM (max) and generates maximum noise of 15.5 dBA only. This 140mm PWM quiet fan can be used as PC case fan or on heatsinks and liquid cooling radiators. Airflow and static pressure figures for this fan stands at 59.5 CFM and 1.08 mm H2O respectively. This silent fan is a fine product of German engineering and is one of the best silent 140mm fans out in the market. Yes, it is a bit on the expensive side but is totally worth it. Fractal Design is Sweden based company which is popularly known for its high-quality computer cases. It also manufactures case fans, power supplies and CPU water coolers. Here we have a silent series fan from it which is Fractal Design Silent Series R2 140mm Fan. The fan comes with hydraulic bearing and uses a 3-pin connector. The maximum speed of this 1000 RPM but you can lower it to 800 RPM using the fan speed adapter for super silent operation. The build quality of this fan is pretty good and it has got black frame with 11 white fan blades. The fan generates healthy amount of airflow at 66 CFM but static pressure figure is not so impressive at 0.84 mm H2O only. This fan should be used as a case fan only whether as an exhaust or intake fan. The noise level rating for this fan is 18.5 dBA at full RPM and at 800 RPM it reduces to 14.9 dBA which is pretty quiet. This fan can be used in servers for 24/7 operation. Other good thing about this fan is that it comes with sleeved cable for extra protection. It comes bundled with four rubber screws, metal screws and low fan speed adapter cable. 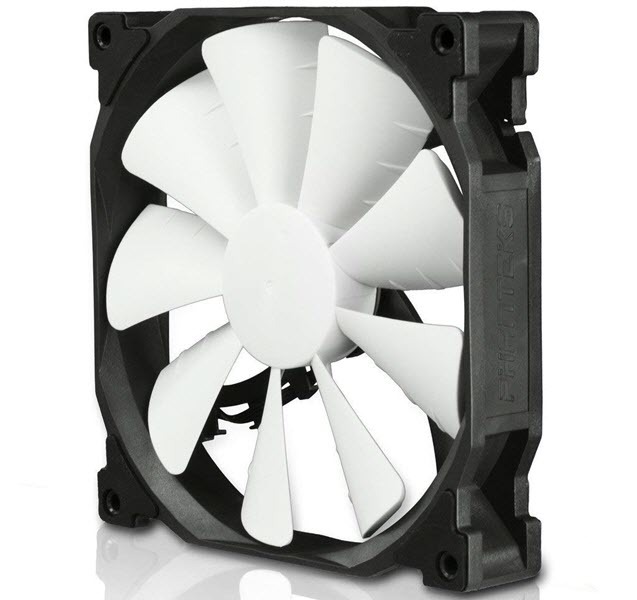 In all, a good quality 140mm quiet case fan that is high on performance and is very reliable too. Phanteks is a Dutch company that is very well known for its top notch computers cases. It also makes case fans, CPU coolers and other case accessories. Here we have a silent 140mm from it which is Phanteks PH-F140XP Case Fan. This is a premium quality high performance silent fan that really blows out the competition. The fan possesses all the qualities and is all-rounder in every field i.e. it generates high airflow, high static pressure and is very quiet even at full speed. The fan uses 4-pin PWM connector and has speed in range of 600 to 1200 RPM. It comes bundled with QSA (Quiet Speed Adapter) for reducing fan speed to achieve even quieter operation. It generates airflow of 85.19 CFM and static pressure of 1.52 mmH2O. Due to these amazing performance figures it can be used as a case fan and on heatsinks and radiators for water cooling. The fan is well built and has strong black frame with white fan blades. It has eight pre-installed rubber pads on corners for reducing vibrations and noise generated due to it. The package includes a 400mm extension cable for cable management, 4 to 3 pin adapter for use with fan controller, rubber & metal fan screws and QSA (Quiet Speed Adapter). 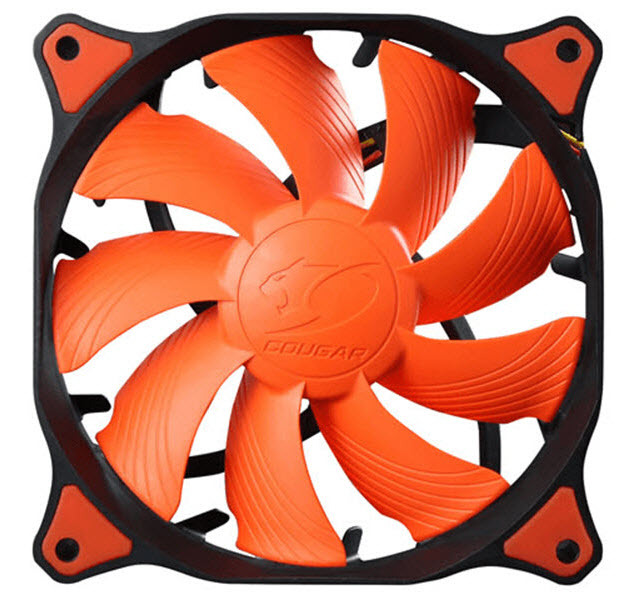 This is unarguably one of the best 140mm quiet fans that you get for your cooling needs. Highly Recommended by me. This is the 140mm variant of the Cougar Vortex PWM Fan. This fan shares the same features and also generates the same airflow (70.5 CFM) as with its 120mm variant, which I have mentioned above in this post. However, it spins at lower speeds of 600 – 1200 RPM and strangely generates a bit more noise at 19.2 dBA compared to its 120mm version. The fan comes with the same features that include Hydro-Dynamic-Bearing, Diversion Groove Blade Design, Anti-vibration rubber pads and features Patented Frame Design. It is also available in black or orange color scheme. Here we have the 140mm version of the Corsair Air Series AF120 Quiet Edition Fan. 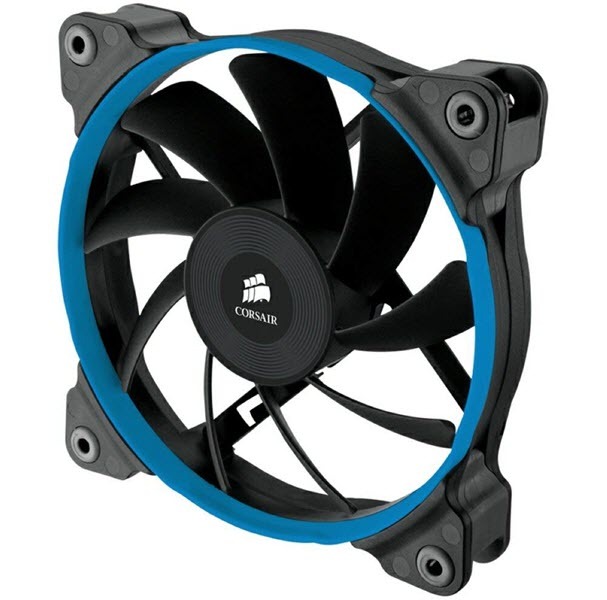 This Corsair Air Series AF140 Quiet fan offers significantly higher airflow compared to its 120mm cousin. However, it is a bit louder at 24 dBA and has rotational speed of 1150 RPM. The fan comes with the same features as in the 120mm variable and also the build quality is the same. It comes with sleeve bearing, interchangeable colored rings (red, blue white) and rubber padding in the mounting points to reduce vibrations. The fan is best suited as a PC case fan only and it can be used as both intake and exhaust fan. For intake fan it must be used in unrestricted spaces otherwise it is better to use high static pressure fan. The fan generates airflow of 67.8 CFM which is quite good and static pressure of only 0.8 mmH2O. Looks wise the fan is attractive and stylish. Also, the build quality of this fan is quite good. Overall, a reliable 140mm quiet case fan for higher cooling performance. Here we have a LED 140mm quiet case fan from Thermaltake. This is a 3-pin fan and it spins at a constant speed of 1000 RPM. The fan comes with hydraulic bearing and 9 transparent fan blades that are optimized for high airflow of 60.55 CFM. This is a nice-looking fan with black frame and cool looking red colored anti-vibration rubber mount on the corners. The fan consists of one LED on each four corners and here we have a white colored LED fan, but it is also available in red and blue color LED variants too. This fan is best suited as a case fan and should be avoided on heatsinks and radiators because of its less static pressure. You can use this fan as both exhaust and intake fan for your computer case. The maximum noise generated by this this stands at 21.8 dBA which is quite reasonable. This fan is a bit cheaper compared to the above mentioned quiet fans from brands like Noctua, be quiet! etc. So, if you want an LED lit 140mm silent fan for your PC case with high airflow then you must grab it now. 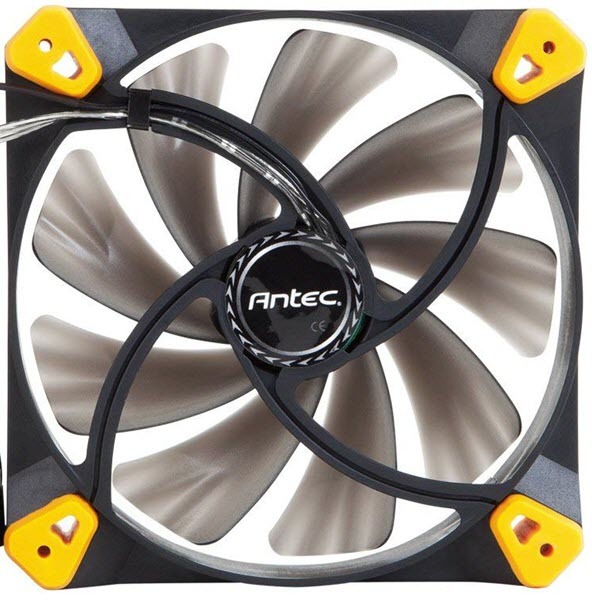 Antec TrueQuiet 140 is the 140mm variant of the previously mentioned Antec TrueQuiet 120 120mm fan. The fan comes with the same features that include silicone grommets at corners to reduce vibrations and 2-way in-built speed switch to control fan speed, which in this case is 500 and 800 RPM. Amazingly this fan generates a bit lesser airflow of 32.4 CFM and almost same noise compared to its 120mm variant. This is a case fan and it should be strictly avoided for use on radiators and heatsinks. It is best to be used as an exhaust fan only. The fan uses 3-pin connector and a 3-pin to 4-pin molex adapter cable comes bundled with it in the package. Not the best quiet fan out here but it is cheaper and pretty silent in operation. Arctic F14 Silent is a quiet case fan that uses 3-pin connector and runs at speed of 800 RPM. The fan comes with fluid hydraulic bearing and generates airflow of 46 CFM which is quite decent for an 800 RPM. The noise level rating for this fan is 20.5 dBA or 0.08 Sone. The fan does lack anti vibration rubber pads but still it is quite a good silent performer and it does not exhibits vibrations because of its lower RPM. You can use this fan as both intake and exhaust fan but in my opinion it is better to use it as a exhaust fan at rear and top of the computer case. Overall, a decent 140mm quiet fan from a very respectable brand. Well it is no brainer that everyone likes their PC quieter and cooler, and these silent 120mm and 140mm fans will help you to achieve this. Some of the above mentioned quiet fans can be used as both as airflow and static pressure fans while some of them are only suited as case fans only. I have listed the best computer quiet fans for all budget and performance, and you select the ones according to your desired needs or requirements. If you have got any queries or doubts on these quiet PC fans then do ask me by leaving a comment below.